Bionature wheat trial shows importance of application timing and essential use of micronutrients. Yield increased by 2 tonnes / ha. An independent study has revealed that yields on winter wheat can be increased by as much as 15% by using Bionature products. The research into timings and rates of application, carried out by NDSM during 2016 and recently published, showed that significantly higher yields – as much as 2 tonnes per hectare more than the farm standard – were possible when the full programme of NHK Delta was used at a very early stage alongside the micro-nutrient products 1-4-All and Tip-Top. When NHK Delta was used just with 1-4-All yields were up 9% compared to untreated wheat, and for NHK Delta on its own the result was 6% higher, or 0.8 tonnes per hectare. 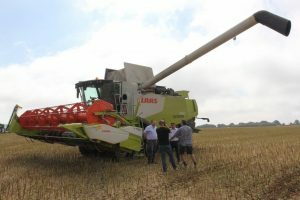 Mark Carter, co-owner of Bionature, said: “Every farmer wants higher yields from their winter wheat and from this new research it’s clear that timing is everything. We were surprised at how much of a difference the timing of that first spray had on the yield. 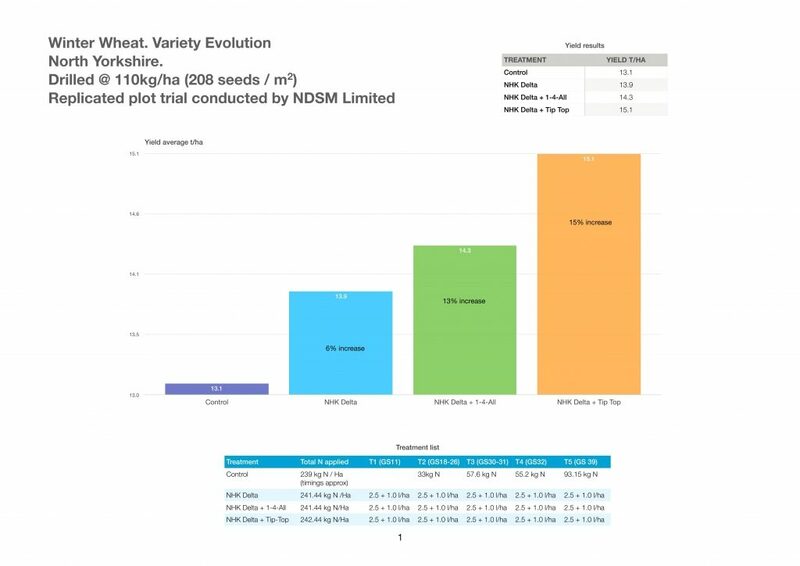 The results show that it is possible to increase wheat yield through smarter nutrition that improves plant health and the number of ears in the crop without impacting on yield quality. The study involved a series of test plots of winter wheat, all growing the variety ‘Evolution’ and treated with approximately 240kg N/ha, plus a full agronomy package of fertilisers, herbicides, fungicides and insecticides. The results were then compared to the farm standard in a control plot of 13.1 tonnes per hectare. For maximum yields, a full programme of five sprays was said to be essential. The first spray had to be at an early stage (1-2 leaf emergence), followed by another at the beginning at tillering, the start of stem extension, the second node and finally at flag leaf. Choosing the timing of that first spray based on growth rather than a calendar date was vital in terms of how the plant roots, tillers, and converts energy to productive rather than vegetative growth. Another finding was discovered when comparing nitrogen efficiency. The standard control plots required 18.2kg of nitrogen for each tonne of yield, compared to 16.1kg when NHK Delta and Tip Top were used.